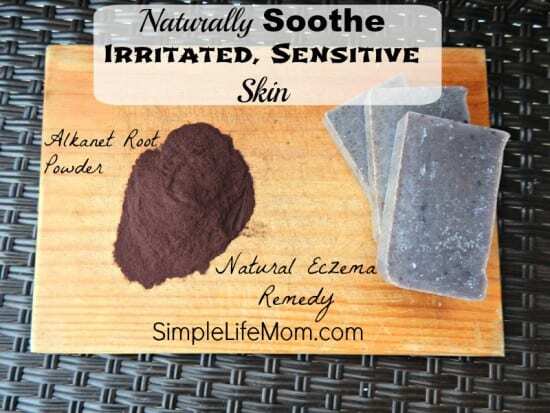 Irritated skin? Eczema? Acne? Bumpy Skin? One of the herbs I use and love is Alkanet Root Powder, because it will naturally soothe irritated sensitive skin. Some know alkanet root as a soap additive to add a pretty natural purple or blue color to their soap. Traditionally it was used to brighten the color of some wines, give corks an aged look, or even to dye clothing. But did you know that you can soothe eczema and detox with alkanet? Alkanet is actually a beautiful violet looking plant with fuzzy leaves and stem. Like many beneficial plants, it is not to be taken internally, but along with being a dye, it has been used traditionally to soothe itching or irritated skin. It is also considered an astringent or blood purifier, and considered a detoxing agent because of this. There has not been a lot of scientific study done on alkanet root , so I cannot give you lab tested evidence. Yet, I can give you experienced evidence. My niece and my brother-in-law (different sides of the family) have struggled with eczema. Both of them experienced tremendous relief after using cold processed soap or shampoo bars containing alkanet root powder. I’m sure just using a natural soap verses a chemically filled soap had its own soothing effect on the skin. 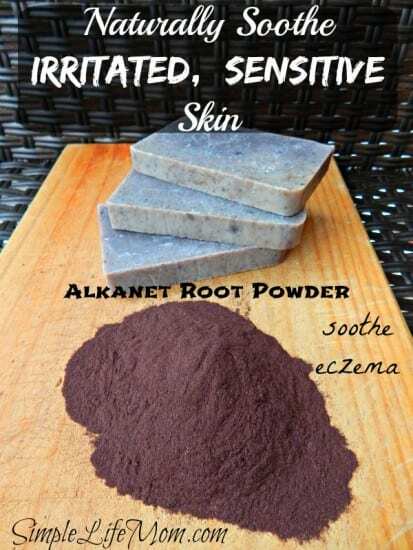 Yet, I spoke with another soap maker last year who said she had testimony after testimony of people who said her alkanet root soap helped to soothe their irritated skin. How Can You Use Alkanet Root Today? 1) Make Cold Processed Soap. I would highly recommend it to soap makers and those looking for soothing soap or soap for sensitive skin. See Homemade Soap for Recipes. 2) Add a small amount to your lotion – obviously in this method you cannot add a lot because you will dye your skin pink. But you can add a small amount of alkanet root powder and still get the benefits without the color. 3) Infuse Oil – Place 1 Tbsp alkanet root in 4 oz oil of choice (sweet almond, olive, grapeseed). Let it steep for a week then strain and rub over irritated skin. 4) Combine alkanet root powder with Arrow root powder for a homemade blush. See Natural Beauty for more recipes. 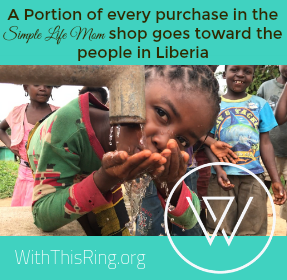 Excellent information…I have not read this before…thanks for sharing with the Thursday Blog Hop! Thank you Pam. Glad you stopped by. Thank you Raia. Hope it helps. Hey Kelly, I have never heard of alkanet root powder before for eczema or sensitive skin – I may have to consider this for the little one. Thank you for this post. I had seen mention of alkanet root powder for coloring, but since my mission is to create a soap for my daughter (who has nasty eczema quite often), I’m really intrigued about this possibility. 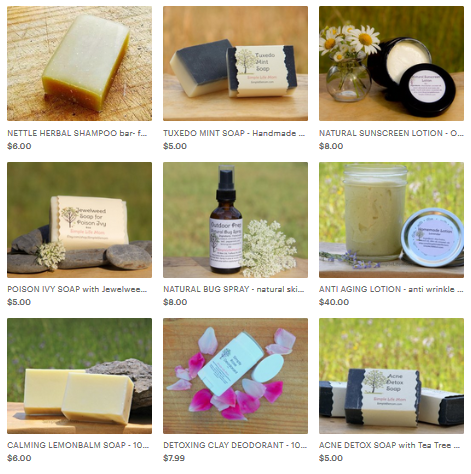 I have looked around but not seen how much you use in your soap batches for healing purposes. Elsewhere, it seems that about 1/4 tsp per pound of oils is used for coloring and that more might cause bleed, but I’m really most interested in how much to use for eczema. I’m also planning to add about 1/2 tsp oat flour per pound of oil as well. Have you combined the two before? I use about 1-1/2 tsp per pound for medicinal purposes, possibly less for coloring purposes. I haven’t heard about bleeding and can’t find anywhere that mentions it!! I have found a number of studies using a tincture of it (16%) on burns and other skin issues and saw amazing results. Oat flour is nicely exfoliating, without being too rough on the skin. Thanks for the info. I am planning to try your 1.5 tsp per pound in my 4 pound batch this weekend. But now I have a new question. I have only added powders to two batches of soap, 2 tsp ground oatmeal to a 3 pound batch and 2 tsp beet powder to a 4 pound batch. In both cases, the result was a brittle bar that just shears off constantly. Is that due to the solids being added to the oil? If so, how does one mitigate that. Finally (sneaking in another question or two), you mention that you cannot use nearly as much alkanet powder for a lotion (in my case, a cream), so how much is enough for effect but not too much to dye skin? And you mention turning skin pink, but I read that this powder dyes soap blue-to-purple. Are there multiple forms of alkanet? Alkanet root powder in soap won’t dye your skin pink. It will in a lotion though. It will turn the soap blue at first (a beautiful color I wish would last), but as it cures it will change to purple. I don’t have a website but make nearly everything I cook from scratch…I can’t stand the taste of canned food, that’s all I can tast is tin. I do a lot of sewing and enjoy making my own creams and lotions. Your site is amazing and I can’t wait to really dive into it. Irene, I’m so glad you found us!! Let me know if you have any questions about anything.